Looking for a Used RC 350 in your area? CarGurus has 647 nationwide RC 350 listings starting at $18,250. There are only a handful of luxury coupes out there that cater to the discerning customer with an artful 2-door body style. Even fewer are the coupes that also deliver impressive performance. At the intersection of these two interests is the 2016 Lexus RC 350, a potent luxury coupe that offers as much performance as it does style. And the RC 350 certainly does not come in short on style, not in the least. The coupe announces its presence with a beamy, curvaceous front hood that gives way to the massive “spindle" front grille and is end-capped by aggressive LED taillights. Those headlights may look rakish on their own, but further examination proves them to be unique 2-piece units that look like nothing else on the road. A bold character line runs from the bottom of the headlight to form the sill of the side windows, flipping up at the rear window in the telltale “kink” that will make the RC 350 stand out in any parking lot. Out back, the integrated rear decklid spoiler gives way to unique taillights and aggressive tailpipes and rear vents. Inside, the RC 350 is a blend of form and function, artfully crisp lines and angles framing an interior laden with high tech features. In the center console (behind the shifter), there is a control pad for the Lexus Remote Touch system, which lets you operate the touchscreen simply by dragging your finger across it. The pad is also able to understand letters and numbers, so you can “draw” the letters of an address or contact rather than entering it through a navigation keyboard, and there are variable levels of sensitivity and force feedback. The controller also gives you access to the Lexus Enform infotainment system. In addition to the navigation system, you can access real time updates for traffic, weather, and even sports and stocks. The 2016 Lexus RC 350 is powered by a dual overhead cam 3.5-liter V6. It sends 306 hp and 277 lb-ft of torque through an 8-speed automatic transmission to either the rear wheels or available all-wheel drive (AWD). The RC 350 is good for a 0 to 60 time of 5.6 seconds with the rear wheel drive (RWD) model, and the AWD model will do it in 6 seconds even. Top speed is electronically limited to 143 miles per hour. For those that crave a more sporty feel from their daily driver, the RC 350 F Sport is available with either RWD or AWD, enhancing the performance nature of the car. The power under the hood is no different, but the visual and handling attributes are--the first things you’ll notice are a unique grille pattern and special wheel design. The wheels (in the RWD model) house massive 14-inch brake rotors arrested by 4-piston high-performance calipers. Inside the F Sport, you get a special digital instrument panel inspired by the Lexus LFA supercar. This variant also features a unique interior with available red leather and heavily bolstered bucket seats to keep you in place during those high-speed turns. Fuel economy for the RWD RC 350 is 19 mpg city/28 highway/22 combined. The AWD model gets 19/26/21. The RC 350 features an array of sensors that help inform a suite of high-tech safety features. The front sensors are for the pre-collision system, which can sense if an object is in the road or if the car ahead has come to a stop. It can warn of upcoming dangers and even intervene if the driver fails to stop. This system also manages the dynamic radar cruise control--simply set your speed, and the RC will maintain that speed until it encounters a car traveling more slowly in front. It will then match the speed of that vehicle until either the vehicle moves or you change lanes. There are also features like a lane departure warning system, blind spot monitoring system, and a standard backup camera with dynamic guidelines. Base MSRP for the 2016 Lexus RC 350 is $42,780 and the AWD model starts at $45,015. The RWD version of the F Sport model starts at $46,885, while the AWD version of the F Sport comes in at $48,715. A fully loaded AWD F Sport model with options will cost around $52,000. 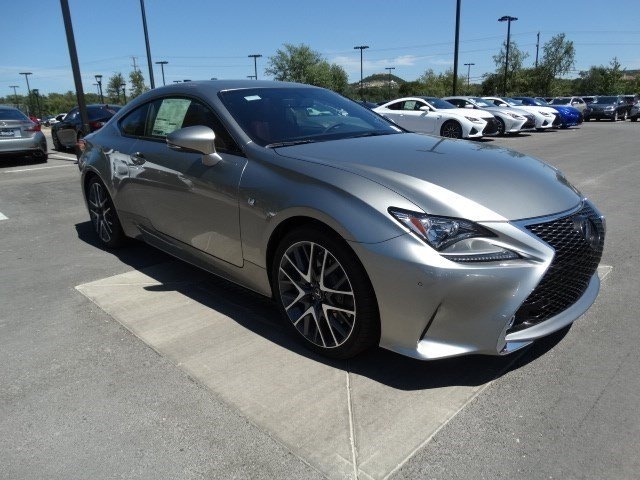 Be it the potent V6 motor, the incredible styling, or the forward thinking infotainment and safety technology, the 2016 Lexus RC 350 makes for one of the most impressive performance luxury coupes on the market. Choosing one would surely elevate the quality of your daily commute--and, if you’re not careful, also shorten it! What's your take on the 2016 Lexus RC 350? Have you driven a 2016 Lexus RC 350?